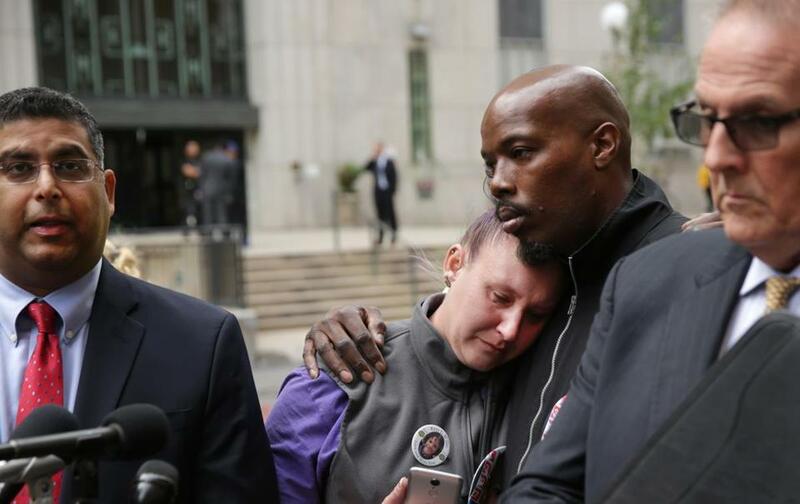 Melissa Willis and Ralph Toney, parents of Kyzr Willis, who drowned in 2016 at a camp run by the city of Boston, stood near lawyers at a press conference in September. On the morning in July 2016 that he went into Dorchester Bay unsupervised, Kyzr Willis asked one of the adults at the Curley Community Center in South Boston for a life jacket. The 7-year-old day camper was told that they only had pink life jackets, for girls. So he went without one, and he drowned. If she is grappling with loss, the city of Boston, which operates the day camp, is dealing with an issue of its own: How much is the life of Kyzr Willis worth? So far, his family has found the city’s answer lacking. The Willis family has filed a lawsuit against the city, claiming negligence. Talks between its attorney, Robert Griffin, and the city’s law department broke down months ago, after what Griffin called an “insulting” offer. City spokeswoman Laura Oggeri said the city hopes a settlement can be reached. Kyzr was in day camp, which he attended every weekday that summer with his older brother, Ralph Jr., and his cousin Savanah. They were the first to notice he was missing, not the adults charged with supervising them, his mother says. That was shortly before the children in the camp were to be discharged, around 2:30 p.m.
By then, Kyzr hadn’t been seen for a while. He had gone into the ocean sometime after lunch. No one knows exactly when he disappeared or who last saw him alive. His body washed ashore shortly after 7 p.m., more than four hours after a search began. Griffin, the family’s lawyer, alleges that the case involves multiple violations of a state law. Christian’s Law was enacted in 2012, after another drowning tragedy. Among other things, it mandates swimming tests for young campers and flotation devices. It calls for them to be confined to areas consistent with their skill level, which in Kyzr’s case was none. Griffin insisted that none of those provisions were observed at the Curley Community Center’s day camp. Christian’s Law can’t save lives if people don’t follow it. Incidentally, when it sailed through the Massachusetts House, then-state Representative Martin J. Walsh voted for it. So did the city’s corporation counsel, Eugene F. O’Flaherty, then a representative from Chelsea. The tragedy has had repercussions, though they have been far too minor. The city revamped some policies days after Kyzr died, to keep better track of kids in its care. The director of the Curley, Fred Ahern, was placed on administrative leave — that would be paid leave — from his $98,495-a-year job. Incredibly, Ahern, a former hockey star from South Boston who spent four years, decades ago, in the National Hockey League, remains on leave 18 months later, with no end in sight. By my calculation, he has pocketed close to $150,000 while “on leave” in a job from which he plainly should have been fired. It’s hard to imagine that the city really wants this case to go to trial. In terms of liability, Griffin offers a compelling analogy: the death of Victoria Snelgrove. She was the Emerson College junior who died in 2004 after being shot by a pepper spray projectile fired by a Boston police officer as she was celebrating the Red Sox victory over the New York Yankees in the American League Championship Series. Following an investigation, the city settled with the Snelgrove family for $5.1 million, in a case that never saw a courtroom, or even an official complaint. In the face of a strong public outcry, the city owned its mistake and paid appropriately for it. Griffin said the offer he rejected on behalf of the Willis family was a small fraction of that. “Victoria Snelgrove was a white female junior at [Emerson College],” Griffin said. “Kyzr was a 7-year-old mixed-race child from Dorchester. The city was entrusted with a young life and failed its responsibility miserably. Nothing will bring back Kyzr Willis. But to compound its grievous errors by withholding the only form of justice left is unthinkable. Mayor Walsh should order his attorneys to look to the Snelgrove case as a model, stop playing games, and settle this case. Melissa Willis said that what she wants, more than anything else, is to move forward. She freely admitted that her family has struggled — still struggles — to pick up the pieces from its tragedy.